Availability: Brand Benicar HCT and generic Olmesartan/Hydrochlorothiazide tablets in 20 mg/12.5 mg, 20 mg/25 mg, 40 mg/12.5 mg, 40 mg/25 mg doses. Benicar HCT contains two active ingredients hydrochlorothiazide and olmesartan. Hydrocholorothiazide is a thiazide diuretic (water pill). It prevents your body from absorbing too much salt which is a major cause of fluid retention. 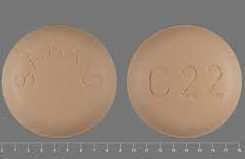 Olmesartan belongs to a group of drugs classified as angiotensin II receptor antagonists. It prevents blood vessels from narrowing, which lowers blood pressure and improves overall blood flow. Used in combination in the form of Benicar HCT, hydrochlorothiazide and olmesartan provide an effective treatment for high blood pressure known also as hypertension. The brand and the generic benicar hct is chemically and therapeutically the same. The only difference is that it is manufactured by a different manufacturer. We currently have the brand from Canada, India and Turkey and the generic from India. It may come from other countries around the world. Other less serious side effects which may be experienced include diarrhea, dizziness/sensation of spinning, dry cough, heartburn, joint pain, and stomach pain. Though the preceding list of potential side effects may not require immediate medical attention in the way that some of the other, more serious side effects do, always consult with a medical professional if you feel that you may be having any sort of adverse reaction to your medication. Always take Benicar HCT exactly as it was prescribed to you and follow carefully the dosage information attached to the product. Do not take this product if you are allergic to olmesartan or hydrochlorothiazide, or if you have problems urinating. To ensure that Benicar HCT may be taken safely, tell your doctor of any pre-existing conditions you might have, particularly: an allergy to sulfa drugs, asthma or allergies, congestive heart failure, diabetes, glaucoma, gout kidney disease or liver disease, high cholesterol/triglyceride levels, low/high potassium levels in your blood. As with any medication, there are certain medications which may react negatively with Benicar HCT. Tell your doctor if you are currently taking any other medications, but particularly: any blood pressure medications, aspirin or other NSAIDs, barbiturates, cholestyramine, diuretics, insulin or other oral diabetic medication, lithium, muscle relaxants, narcotic medications, steroids.